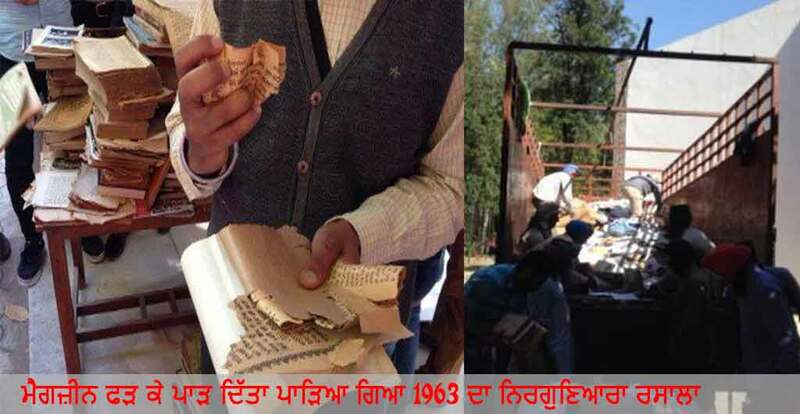 Students of Punjabi University Patiala foiled an attempt by Librarian and other conspirators to sell/destroy rare handwritten manuscripts related to Sikhi. Gurbani Pothiya, Historic Literature and writings, handwritten manuscripts were being sold off in ”Crap” (RADDI) by Librarian. When Students noticed it, they stopped the truck and took literature in their possession. Librarian SAROJ BALA said she has got atleast ONE COPY of every Book/Writing which was being Sold, but when the students demanded her to show the copies she could not. Instead she tore down one Magazine ”Nirguniara” which students had recovered from truck. Now the SIKH STUDENTS are protesting against this conspiracy to destroy SIKH HISTORICAL BOOKS which were being stored in University. They have demanded suspension of Saroj Bala and filing a case against her and her co-conspirators and have demanded DIGITIZATION of all the Manuscripts which have been recovered and which are present in University LIbrary.